Most of our guests comment that photographs displayed on the web site don't do the Cottage justice. The tranquility found while staying in the Cottage and enjoying Kim's wonderful gardens cannot be described. The Coromandel beaches are among the most beautiful on the planet! Within a 1 hour drive are Whangamata Beach, Hot Water Beach, Hahei, Cook's Beach and Whitianga township. Of course Pauanui Beach is one of the best swimming beaches and is only a 5 minute drive from the Cottage. The Tairua/Pauanui estuary is great for swimming, sailing, skiing and jet boats. There are some wonderful bush walks for trampers nearby and only a few kilometres away are some great fresh water swimming holes in the Tairua river. Right next door is the Lakes Resort Golf Course, a fantastic championship golf course that includes restaurant and bar facilities for after game relaxation. yglass - December 2011 - What a fabulous property! Very private, spectacular views, very well equipped and immaculately kept. Didn't want to leave! If we return to New Zealand - this is where we would come. tsullivan - January 2013 - Private and gorgeous "bush" location with amazing views and private garden and seating areas. The cottage is well equipped, attractive, very clean and tidy. A very relaxing location and great for a second honeymoon! We really appreciated the extra touches (servicing after three days, fruit, a few provisions, lots of towels etc) and trouble taken to make the cottage lovely to stay in and make our holiday very special, Many thanks Kim! 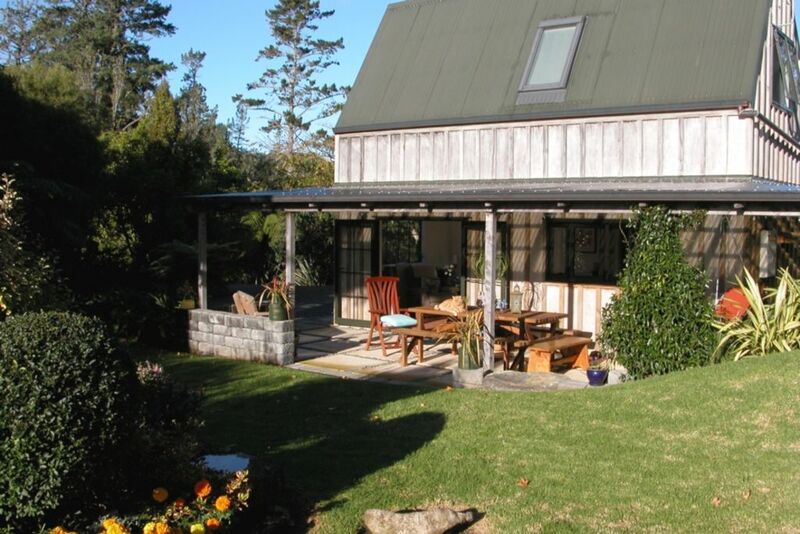 The Cottage is not suited to pre-school children due to steep terrain nearby and the bush setting. We do not accept pre-school children. The Hill is unique, peaceful and magical. The driveway is nearly 700 metres long and provides incredible privacy whilst still being only 6kms to the nearest town and beach. We endeavour to ensure that your stay here is as special as we can possibly make it - surrounded by gardens and trees with your own huge deck and covered outdoor area. Total privacy in a native bush setting and fabulous gardens. This property is even more stunning than the photos show, amazing location with beautiful gardens. One of the best properties i have stayed in. Lovely cottage, very comfortable and immaculately clean and tidy. Lovely gardens, a very peaceful spot. Very cute and beautifully presented bach. Very cute and beautifully presented bach. The photos don't do it justice. A wonderful, gorgeous cottage, plenty of space with a greay view. A wonderful, gorgeous cottage, plenty of space with a greay view. So close to the township whilst still making you feel like you were entirely separated from the world. An amazing place to finish our honeymoon!